The Senate agreed Thursday to add $600 million to the effort to stop the flow of illegal immigrants across the U.S. Mexican border. The money would be used for such purposes as adding 1,500 new enforcement agents and deploying unmanned aerial drones to improve border surveillance. The voice vote to pass the emergency spending came in the final hours before the Senate leaves for its month-long summer break. 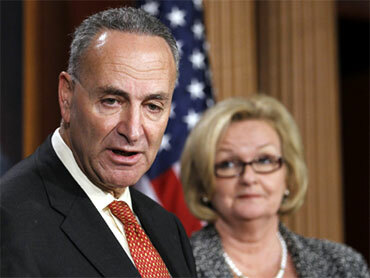 Its sponsor, Democratic Sen. Charles Schumer of New York, said it would boost border spending 10 percent above 2010 levels. President Barack Obama has urged Congress to come up with $600 million to reinforce border security, and, with Arizona's attempt to crack down on undocumented immigrants bringing national focus to the issue, both Republicans and Democrats have endorsed more robust border security spending. The main stumbling block has been how to pay for the increased spending. Republicans sought to use unspent funds from the economic stimulus act, an idea rejected by Democrats. The Democratic plan passed Thursday would boost fees assessed on foreign-based personnel companies that take advantage of U.S. visa programs, such as the H-1B visa program for temporary skilled workers, to bring foreign workers, mainly from India, into the United States. The House last week passed similar legislation with $701 million in emergency money for border security. It could take up the Senate bill when it interrupts its August recess next Tuesday for a one-day session to approve a Senate-passed jobs bill. Schumer, who announced his proposal earlier Thursday with Sen. Claire McCaskill, D-Mo., challenged Republicans to put aside differences and support the measure. "It's a test of people's seriousness when it comes to the border," he said. Sen. John McCain, who last week joined fellow Arizona Republican Jon Kyl in introducing a $701 million bill, initially objected, saying it was insufficient. He suggested, among other things, the addition of $200 million to support Operation Streamline, a program begun under the George W. Bush administration subjecting anyone who crosses the border illegally in areas where the program is in place to federal charges with prison terms of up to six months for the first illegal entry. Those who re-enter face prosecution for felonies punishable by up to 20 years in prison. When Schumer said he could not accept McCain's amendments, McCain agreed to back the bill. "I believe we have a lot more to do, but this will contribute to our effort to get our border secured," he said. The legislation includes $176 million for 1,000 new border patrol agents to form a strike force to be deployed at critical areas, $89 million for another 500 customs and immigration personnel and $32 million to deploy unmanned aerial vehicles or drones. It provides an additional $196 million for the Justice Department to bolster its forces of U.S. marshals, and FBI, DEA and ATF agents along the border. "Now our attention must turn to comprehensive reform, which is the only way to fully address the problem of illegal immigration," Schumer said after the vote.